A scifi revision to the well-known mantra from The Wizard of Oz. 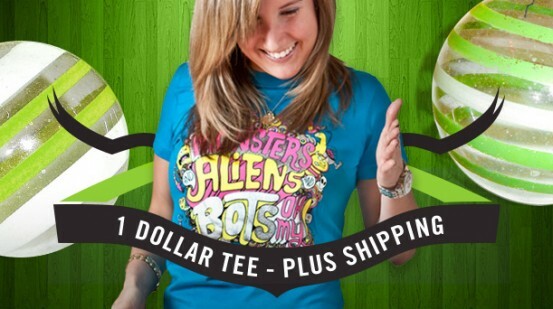 Get a copy of Monsters, Aliens and Bots, Oh My! for only $1 plus shipping. You can also get it on American Apparel for only $2. Consider it a gift from the Chop Shop for 2014.… Since you are paying for the shipping anyway, why not grab an additional $5 tee (see below). In addition to the $1 tee we thought we might also offer a few other titles running low on stock that are not planned for reprints. Lets call it making room for something new. You will not even need a coupon code or take up smoking to take advantage of this offer. Just make the purchase before midnight tonight. Get Ham Shot First, Explore Space, Right Might, Four Endings or Agent Rawhide Reagun for only $5 each (add $3 for styles on American Apparel).